A perfect balance of flavors–earthy red dragon fruit, tangy key lime, sweet rum, and fresh mint–this pink effervescent cocktail will be the talk of your party. Optional garnish: sugar cane swizzle stick, dragon fruit slice with skin on, lime slice/wedge, and/or mint sprig. In a tall class, muddle together mint leaves and sugar until mint leaves are bruised. Add dragon fruit, and muddle until sugar is dissolved and dragon fruit is mashed. Add lime juice and Dragonberry rum. Fill the glass to the top with ice cubes, and top with club soda/sparkling water. Mix well. 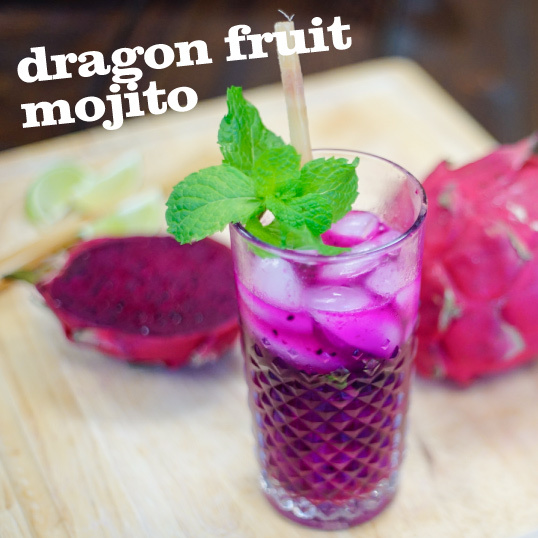 Garnish with sugar cane swizzle stick, dragon fruit slice with skin on, lime slice/wedge, and/or mint sprig. The alternative will not taste exactly the same, but it’ll still be just as tasty! Instead of Dragon Berry rum, use regular light rum, add 1 teaspoon sugar, and 4-6 blueberries and 2-3 strawberries.